To fund or not to fund, that is the question. The uncertainty over paying Lebanon’s contributions to the Special Tribunal for Lebanon has occupied politicians for the past few months and cast a shadow over Najib Mikati’s cabinet since its inception. After hinting at resignation last week, today Mikati announced that he had used funds from the Disaster Relief Commission, which is under the PM’s direct control, to pay Lebanon’s contributions to the STL. The announcement followed intense last minute efforts by the Speaker Nabih Berri to avert Mikati’s resignation and the collapse of the government. The immediate significance of this decision is that the showdown over the STL has been delayed for at least another year. Quibbling over the funding of the Tribunal was more of a symbolic confrontation that allows the different parties to make a show of sticking to their positions without making any real impact on Lebanon’s relationship to the STL. As I have argued before, neither the STL opponents nor its supporters have maintained a principled stance towards it. The legacy of this short-sightedness and lack of spine means the addition of another chronic issue to plague Lebanese politics to the host of ingrained concerns. However, in the short term, PM Mikati seems to have negotiated the STL issue very well and used his clout to pass the funding decision despite the empty protestations of his ‘allies’ in Hezbollah and Aoun’s FPM. In effect, the ‘formula’ that Nabih Berri godfathered was a face-saving mechanism designed for the benefit of Hezbollah and the FPM. Mikati’s credentials among Sunnis will no doubt be boosted by this decision. This boost will further undermine Saad Hariri’s claims to the premiership as Mikati’s ‘third way’ appears to be paying dividends. In the absence of a real appetite for changing the cabinet, partially due to the situation in Syria, Mikati can continue to build a solid base of support while Hariri remains in his self-imposed exile. In parallel, Berri’s timely intervention illustrates the unique role that he plays within Lebanese politics as a consensual figure. Berri cannot afford Hezbollah’s hardline tactics, and his authority has been built since the 80s on his skill in manufacturing consensual arrangements. Such arrangements represent a constant feature of the Lebanese political system and its aversion to conclusiveness. Berri’s intervention prepares the groundwork for the role he will play in the next stage in Lebanese politics, a role that unlike Hezbollah he has to constantly maintain. When it comes to Hezbollah and the FPM, their acquiescence on the issue of the STL funding exposed the distance between rhetoric and practice that typifies their brand of pragmatism now. It is particularly revealing in the case of Hezbollah whose members were named in the STL indictment. This could be a tactical decision to delay the final confrontation over the STL until the situation in Syria clears up, but it is more likely a symptom of their chronic disaffiliation with the state that allows to see themselves simultaneously within and without its jurisdiction. This is often expressed through Hassan Nasrallah’s ‘assertive indifference’, to coin a phrase, over matter such as the STL. The biggest losers however have to be March 14, who have invested so much hope and political capital in the STL, only to see it adopted by Mikati now. Their position is further weakened by the fact that Mikati can now exploit his support for the STL politically while they won’t be able to make any political gains through it. It is very hard to see what March 14 stands for anymore, as they continue to slowly decline into irrelevance in the absence of any clear plan for regaining power. As recently as July, they were still pinning their hopes on the STL and failing to anticipate that Mikati could negotiate this hurdle and turn it into a political advantage. But the Lebanese people also lose as the STL becomes an entrenched divisive feature on the political scene, and one that we cannot influence ourselves. March 14 want the STL as it is both a political card and an essential demand to achieve justice. Anything going the STL way means March14 are winning. If a predominant Hezbollah gov accepts funding the STL (even though indirectly), it mean March14 are in a stronger position, maybe not intentionally but still. As for Mikati, it is very simple what he is attempting to do. He sees Syria weakening and himself weakened by his position on top of the government. He is trying to gain back some Sunnite trust in order to safeguard what's left of his political career. Tripoli Sunnites will not turn on Hariri and like Mikati cause he funded the STL. For them Mikati is with Hezbollah and funding the STL came from international pressure and he's just a dummy controlled by HA and the Syrians. The biggest loser from all this is Aoun and the proof is that he did not say a word yet. He's been campaigning against the STL and threatening to resign from the government, and now it looks like he was given orders and had to shut up. Najib, I think we have to be a bit reasonable in our assessment. 'A predominant Hezbollah government' is hardly accurate given than they only have two ministers and they have gone out of their way to make Mikati's life easy. This is not out of the goodness of the party's heart, but because they have no wish no rule, they need a broad coalition in government as long as it guarantees them a unique and protected situation. It's an aberration, but even Hariri Sr did that for a long time. As for Mikati, you're writing him off too easily. The thing about Sunni leadership in Lebanon is that it is no longer guaranteed for anyone. Salim Hoss discovered that, and Saad Hariri even more so. If Mikati continues in a way that doesn't alienate the majority, he will continue to gain grounds at the expense of Hariri. As for March 14, in its current form it's pretty much over. It doesn't mean its components won't survive, but there will be splits and new alliances. Their faith in the STL was misplaced because it has become a burden, they were expanding political capital to defend it while it was supposed to be the other way around. The simple answer about the STL is that Hezbollah agreed to this because it doesn't fear the consequences any more. The indictment proved that there won't be 'big fish' or political leaders indicted, so it's clear that they want to end it with a minimum amount of damage. Also, crucially, Saad Hariri himself exonerated Syria when he didn't have to do that and undermined the process and the STL by doing that. So what's left of the STL is only a recipe for further conflict within Lebanon, not what March 14 imagined when they started the process. Aoun lost but it won't affect his support. He took on more that he needed to because the STL is a Hezbollah issue and not his issue, and he doesn't have the strength on his own to fight it. My point always was that justice had to be done through Lebanese mechanisms, relying on the STL was dangerous and unpredictable. Now everyone realises this and they want a safe exit so it doesn't blow up. If you really think the current government can take decisions without referring to Hezbollah, than you have to redo your calculations. Doesn't matter if they have one or two ministers, all political decisions have to go through HA, and if HA had not approved STL funding, Mikati would not have been able to do anything. As for Sunni leadership in Lebanon, there's Saad Hariri and all those wanting to be him. Mikati is far far away from presuming Sunni leadership. The Sunnite leadership is in Hariri hands and there's no one who can deny him this position, even he's outside Lebanon. This came in the news today. Just to show you that it wasn't Mikati who found the way out and you should not give him much credit. "A “well-informed” source told Al-Manar television that Speaker Nabih Berri came up with the solution to transfer Lebanon’s share of funding to the Special Tribunal for Lebanon through the Higher Relief Council." I find it weird that you say that about March 14 at a time where they are united more than ever and Jumblatt is even considering coming back. A Aounist would talk that way but I expect better from you. Splits and new alliances? between who? Their faith in the STL and their democratic ways to fight for it and their rights have only proven to be the right one. The only mistake was the lack of pragmatism and initiatives. STL means Hezbollah is a murderer. HA did not launch all this campaign to accept the tribunal at last. It means disaster for him and he will never accept it. It fears its consequences more than ever today than Syria is under fire and Iran as well. STL is a big thing and the best thing M14 did lately was let its process go and stop exploiting it on every occasion. The only person who was doing that extensively and damaged its reputation was Jumblatt. Wen saro dakhlak chouhoud el zour?? STL is the best thing that happened to this country since Bashir Gemayel and we would be fools if we let it go easily. It might bring in dangers but its outcome is crucial for all Lebanese and any future political life in Lebanon. Najib, my job is to analyse not manage expectations. I have no sympathy for March 8 but it's important to deal with the facts. Time will tell. 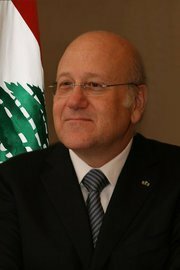 Mikati has shown that he truly deserved to be appointed as a prime minister. Unlike other people, had had the courage to do what is right and fund the tribunal rather than being afraid of the people who are against it! I have found this really interesting website that has a lot of information about Mikati. Including his family tree, photoalbums, timeline, relatives, profile etc.. Check it out, its fun!